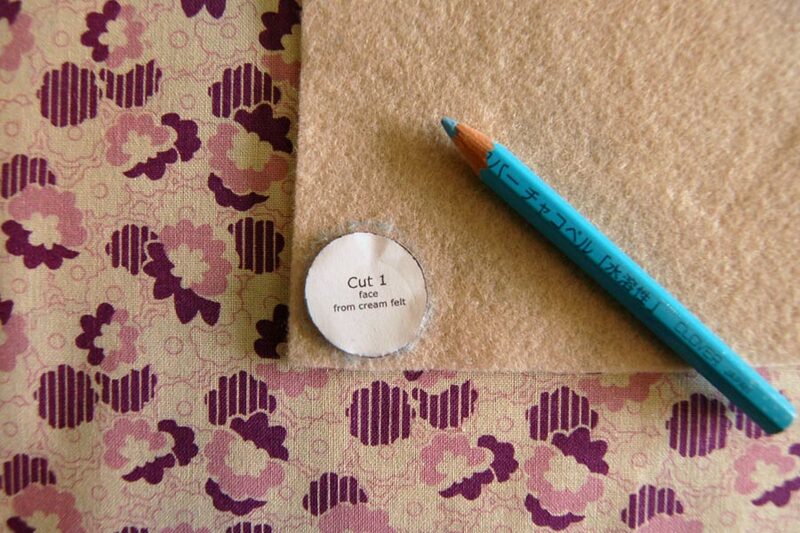 The blog of a Columbus, Ohio fabric shop: sharing the love of sewing! They're happy to be anywhere that they'll be smiled upon and praised. clear, fast drying fabric glue like "Unique Stitch"
First print and cut out all pattern pieces. 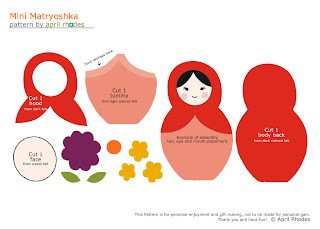 Choose the colors for your Matryoshka's hood, back and tummy. Next, you can either trace your pattern pieces onto the felt with a fabric marker or pencil, or you may opt to use itty bitty applique pins to pin the pieces down and cut around them. 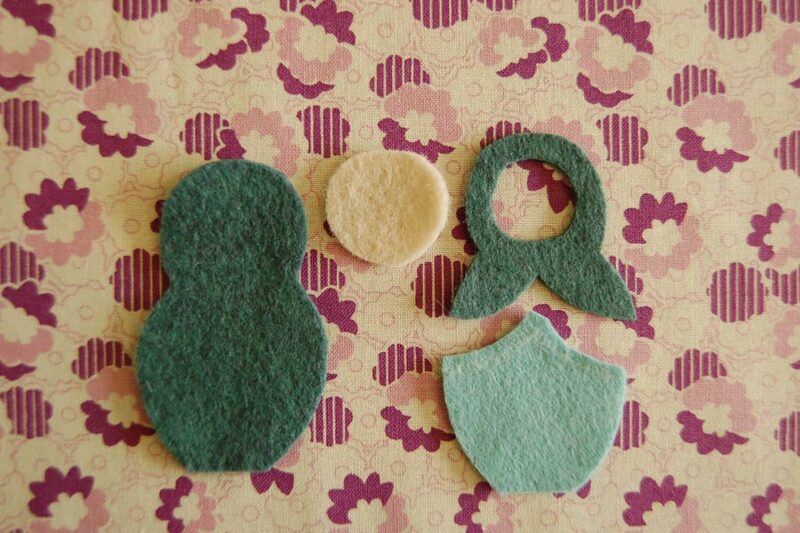 I use both methods depending on the pattern piece's shape and size. 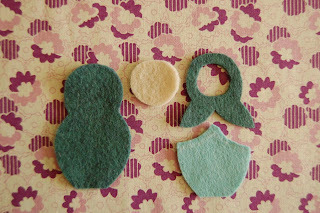 Cut out you doll's face, hood, tummy and back of body. Be sure to mark where her hood overlaps her tummy piece. 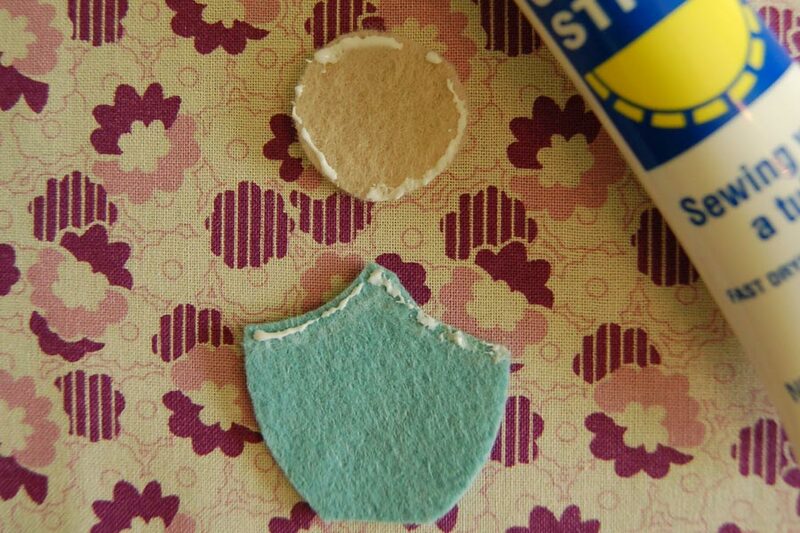 Apply a tiny amount of glue around face and top edge of tummy. Glue her face behind her hoods opening and then line hood up with the top of her tummy (along overlap line). While the glue is drying choose and cut out your flower design. Feel free to play around and come up with your own flower and leaf combinations. 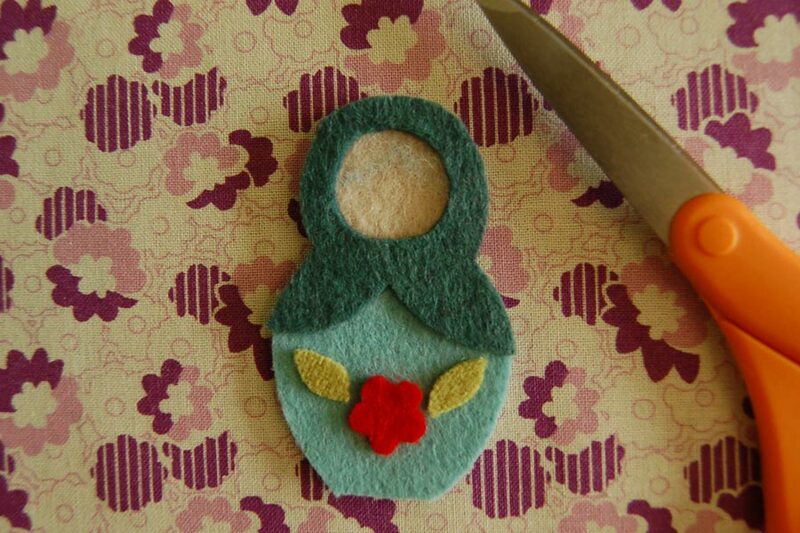 Attach your flower design to your doll's tummy. 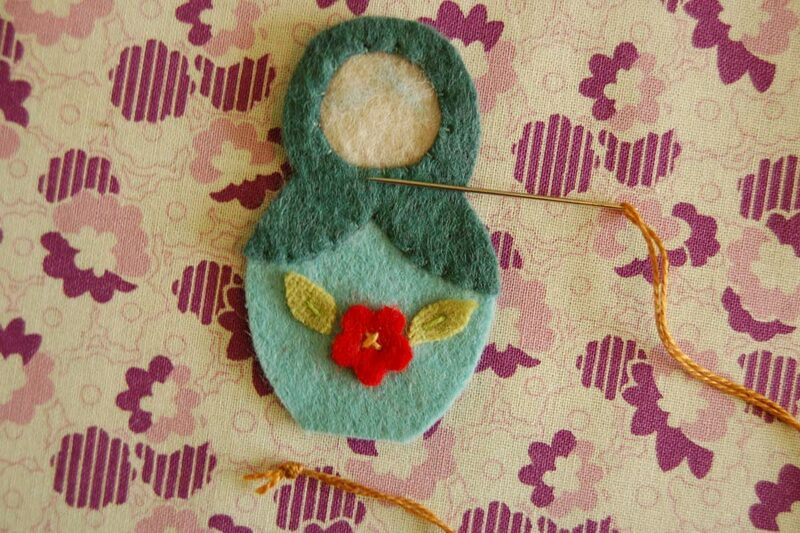 I use a single straight stitch to attach my leaves and either a french knot or cross stitch in the center of my flowers. After the glue has dried, using a single strand of coordinating thread, take some small stitches around the base and opening of the hood, to secure your gals face and tummy. 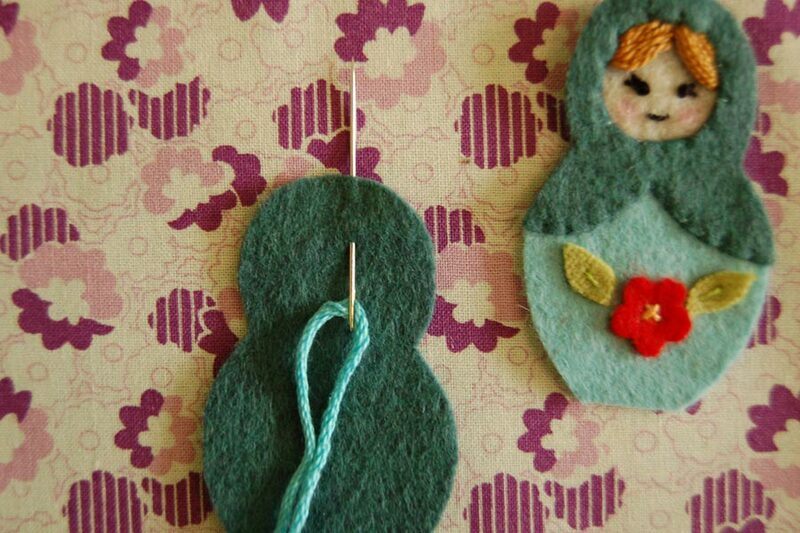 Next using a double strand of hair colored pearl cotton or floss, satin stitch her hair. Use the pattern as a guide for placement and stitch slightly under the hood as you go, so as to avoid any bald spots. Now mark eyes, lashes and mouth placement and stitch with a single strand of black pearl cotton/floss. 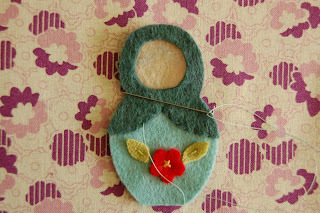 Use a twice wrapped french knot for the center of her eyes and straight stitches for her lashes and mouth. 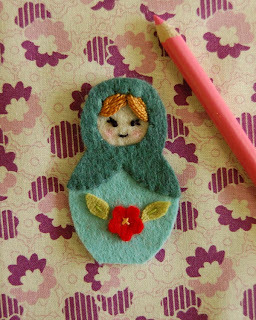 Draw on your doll's blushing cheeks with your pink colored pencil. 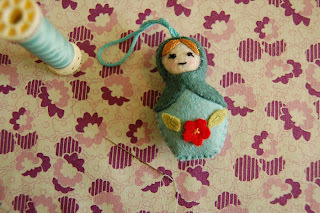 On the back body piece, using a large needle, pass the 6" of yarn, knotted at the end, through center of felts loft and come up at the top of your dolls head, this will secure your dolls hanging loop, but you should not be able to see the stitch from the doll's back side (see photo bellow). 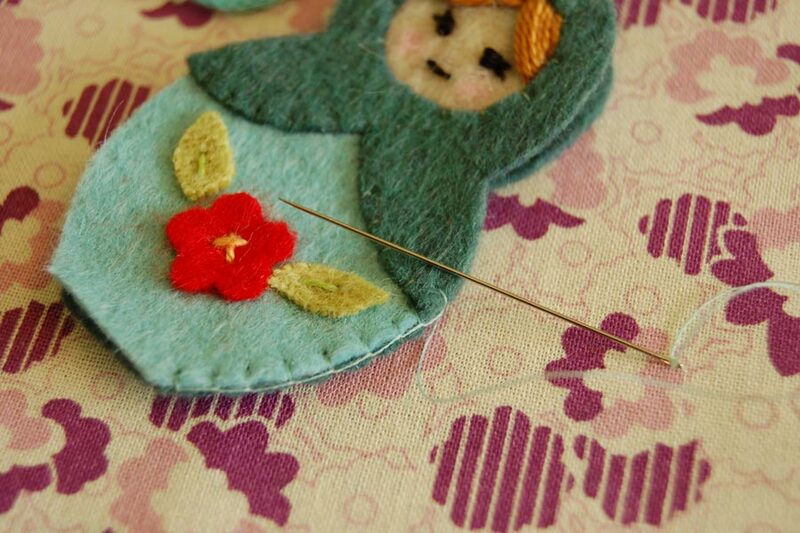 Draw needle back through the center of the felt and out next to your original knot. It helps to hold the felt at the doll's head secure between two fingers as you do this, and you may need to reshape the felt a bit at the needles entry point. Knot the yarn an inch from the end, trim off excess and pull loop taut. Sandwich the two body pieces together. 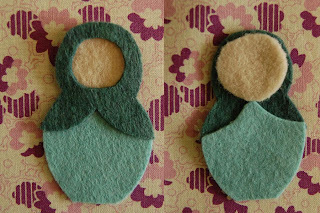 Starting at the bottom right corner of your little lady's body, blanket stitch her front and back pieces together using a single strand of coordinating thread. Stop at the opposite corner, leaving the bottom open. Stuff firmly. Use the end of your pencil to help push stuffing into her head and body. 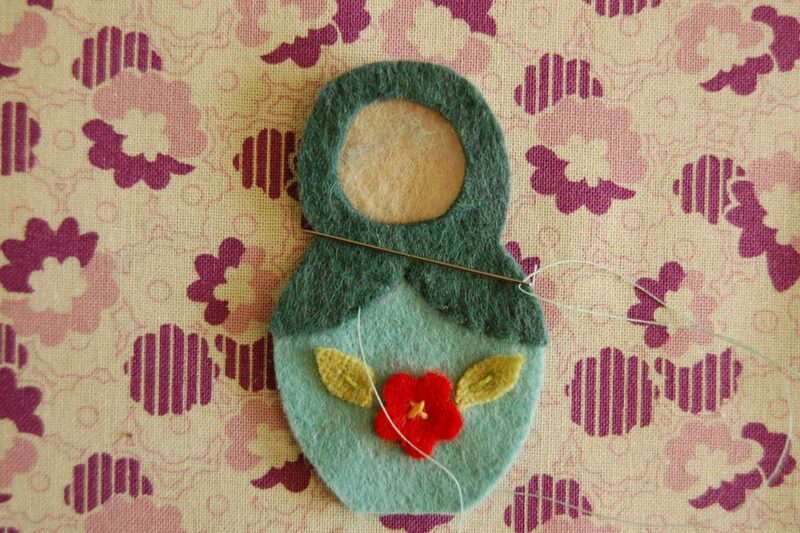 Finish by closing her up with blanket stitch across the bottom. 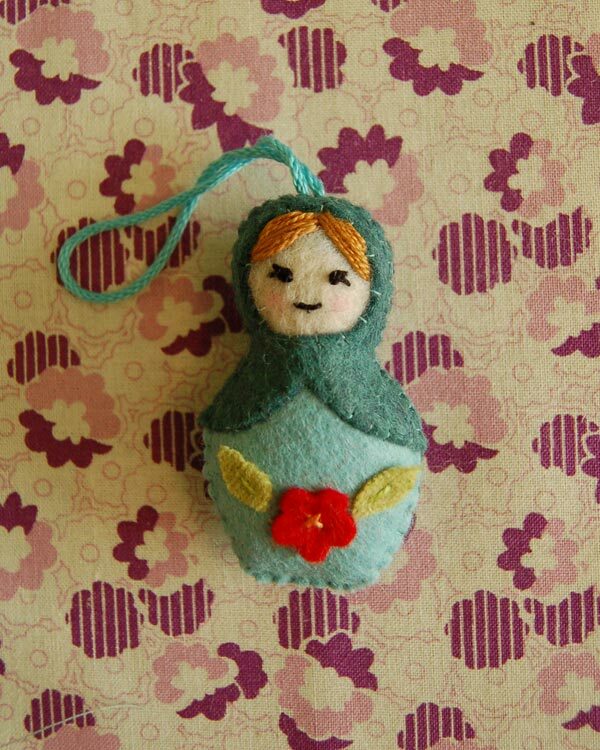 You've made a sweet little dolly to hang from your tree or anywhere that brings you joy. Now make some more and give them to your friends. Everyone is sure to delight in their delicate cuteness! Thank you. This is so beautiful. It reminds me of my grandma and my Eastern European heritage. So lovely! Thanks for this super cut idea! Even the tutorial is cute! April - Thank you so much for changing the text! Just found your blog, this tutorial is adorable! Thank you very much for sharing this lovely project, I shall be making a few to go in my family's and special friends christmas presents ! magic ! These are adorable! I like them so much that I linked to them on my blog, www.namesakedesign.blogspot.com. I can't wait to try making my own. Olá!Fiquei tão feliz ao ver as bonecas e resolvi fazer para da-las aos meus netos e netas. sempre queiz aprender a fazer porque me lembra o Pais proximo que meu papai nasceu à querida Polônia.Obrigada e feliz Natal. Com muito amor e carinho desta aqui do Brasil.blog-da-vovo.blogspot.com jinhos.Vera Fonseca. I love matryoshkas. These are darling! How kind to share this tutorial. THANK YOU!!! April, you have made my day! Thank you so much for sharing this tutorial. 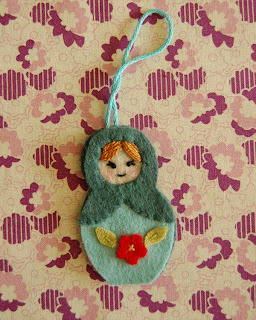 I love Matryoshka dolls and now I can make a million or a few for my Christmas tree. I love this tutorial! 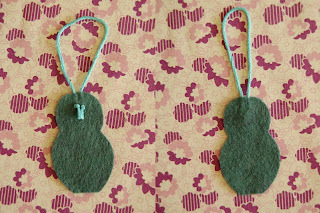 I've just made some and they are so cute. I'm going to include some with presents I'm giving this year. Thank you! I have a thing for anything Matroyshka! thank you for sharing this tutorial! These are charming. Thank you for sharing them with us. 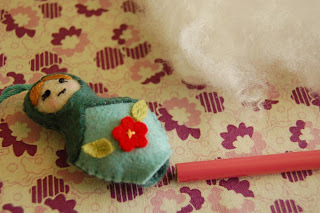 I really enjoyed making this precious doll during your workshop today (despite all my pouting and complaining!). She looks beautiful on our Christmas tree, and I'm so proud of her! You are a very patient and talented instructor. I look forward to putting all of your great techniques into action again to make some more of these little darlings. The creative possibilities are endless! Thank you for such an inspiring project! thanks so much for your lovely idea and pattern! 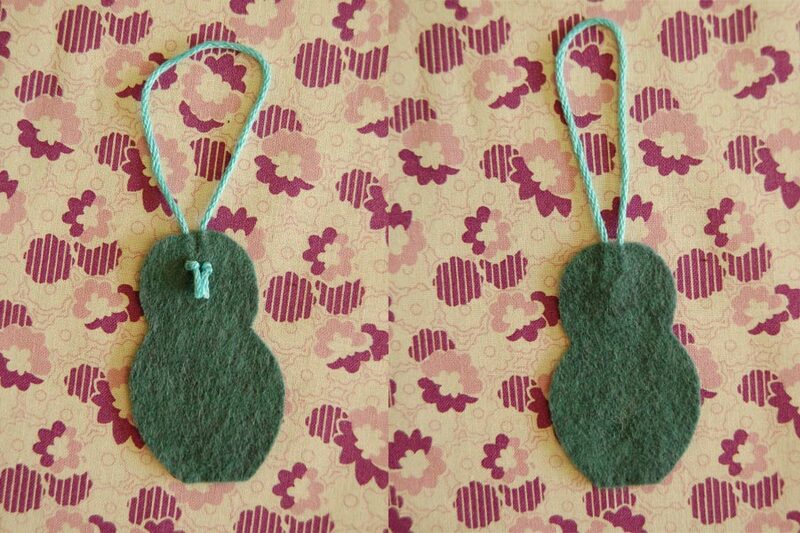 I just made one for our Christmas tree and we love it! Thank you for generously sharing this pattern. I will save it for next year. 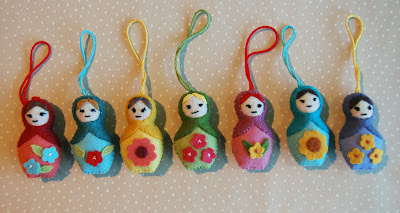 I was searching for a cross stitch pattern for matryoshkas, but I love these and will definitely be having a go at making them. Love them!! Definitely going to have to make me a batch! My husband went to Poland and brought us stacking dolls when he came home! I have 3 girls... wonder if I can/will make enough for them and me!? :) Thanks for sharing. Oh, found you via Pinterest.com. You may have a look at my versions on my blog. Way too cute! I'll have to convince my mom to sew a few into keychains for me! Made one for my tree last year and loved it so much. Now, I'm attempting to make 50 of them in the next 3 weeks to give as gifts. Wish me luck! Any tips for mass producing? Thanks for sharing the pattern! 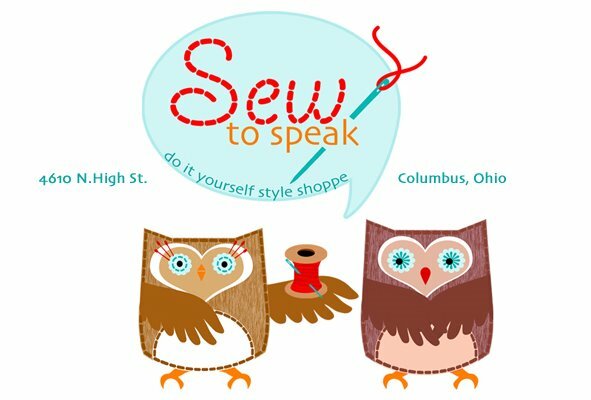 I'm in Dayton, OH, so I will definitely try to visit your shop when I am in Columbus next! Love Matryoshkas!!! 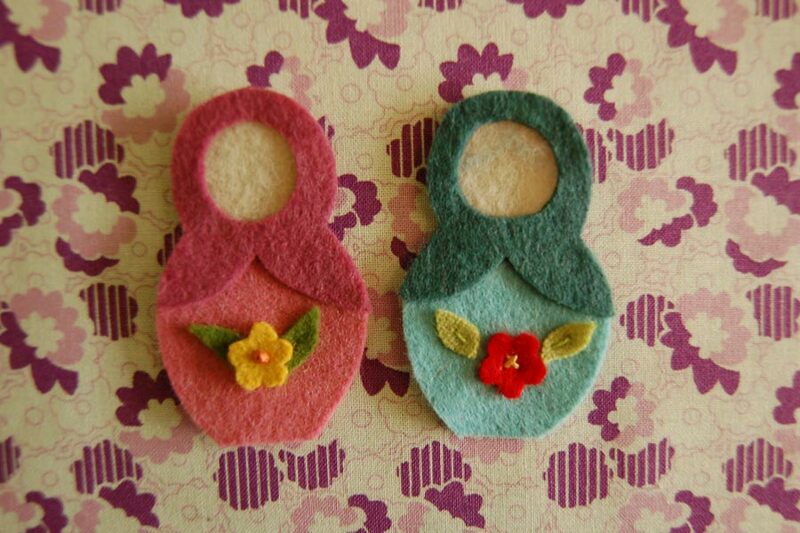 These are lovely and very easy to make. Thank you very very much from Uruguay!! 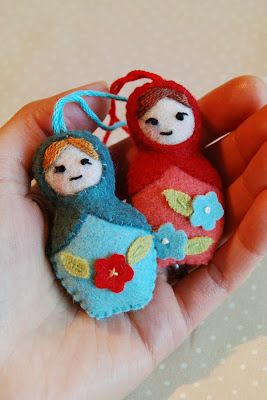 oh my these Mini Matryoshkas are super cute!!! I love that they're easy to make too! I featured this in my blog: http://www.plushiepatterns.com/mini-matryoshka-doll/ thanks for sharing! Welcome to our blog. This is were we fill you in on all the lovely things that go on in our Shoppe, our lives and our imaginations. Thanks for visiting! All of your comments are greatly appreciated. This is a Flickr badge showing public items from the Sew To Speak - Columbus, OH group pool. Make your own badge here. 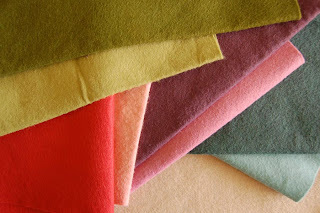 All original images and text on this website are copyright and the property of their original creator or Sew To Speak. All rights reserved. Please do not use any content from our site with out first asking permission and giving due credit. Thanks. Thanks for checking out our blog! 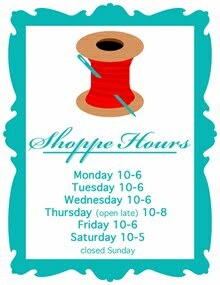 Stop by again soon (or come see us in the shoppe). Take care. BYE BYE. 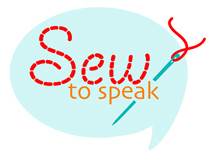 Copyright Sew To Speak. Simple theme. Powered by Blogger.